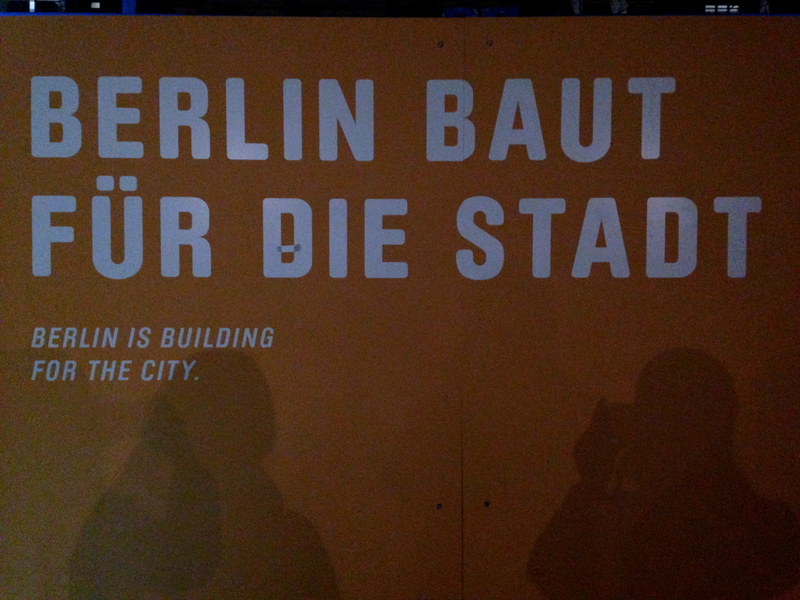 …Or rebuilt. 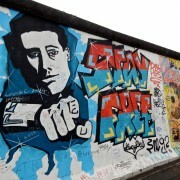 In Berlin – a city physically divided for 28 years and socially, economically and politically divided for over 40 – the fall of the wall broke the barriers of communication enforced in the east by the Soviet regime and opened discussions of the past that were impossible under communism. Tearing it down allowed for the reunification of a city, a country and a collective German memory, but it also raised a complicated question: how should Germany commemorate the Holocaust? 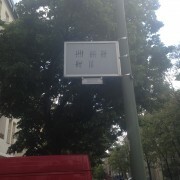 These complexities of commemoration exist in Berlin for two main reasons. 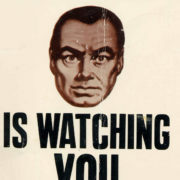 The first, and most obvious, is because of Germany’s role as perpetrator in World War II (WWII). The other is because of the division and lack of discussion as a result of the occupation that lasted from 1945 until 1989. 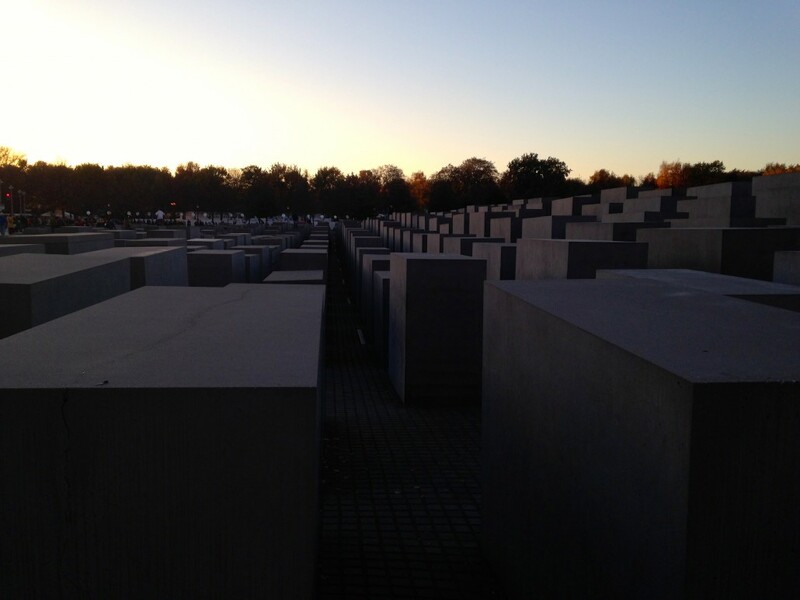 Two weeks ago, on my first trip to Berlin, our class visited three Holocaust memorial sites: the Memorial to the Murdered Jews of Europe, the Memorial to the Sinti and Roma Victims under National Socialism and the Memorial to Homosexuals Persecuted under Nazism. My experience and impressions at each varied based on the names of the monuments, their location in the city, the information available and the behavior of the visitors. The Memorial to the Murdered Jews of Europe was the first of these three to be completed in 2005. The monument includes 2,711 stelae on an area that is nearly five acres large. 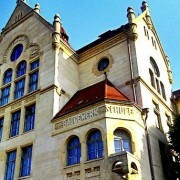 It is located in a very public space along one of the main streets leading into the heart of Berlin. Although there is an underground “Place of Information,” there is nothing available at street view for the mere passer-by. Within the memorial, some people were standing or slowly walking, others were sitting on bench-height slabs, or jumping from lower ones near the sidewalk to the higher ones in the middle, or running around the inside playing tag and hide-and-seek. 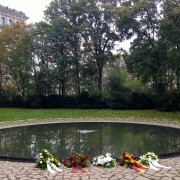 The Memorial to Homosexuals Persecuted under Nazism was done in 2008. 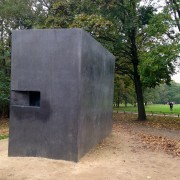 It is a large, cement box that replays a video of two males kissing. 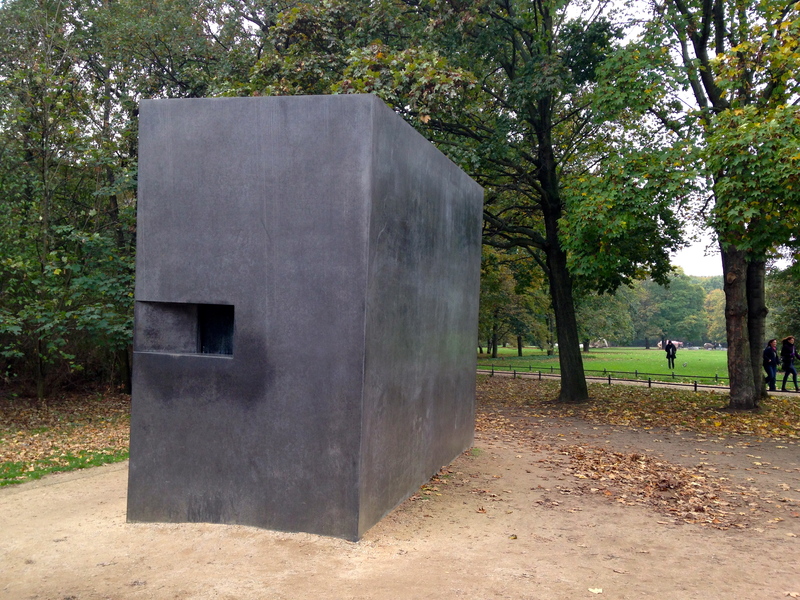 It’s located in Tiergarten Park, on the same street as the Jewish memorial but the opposite side of the park from the Roma memorial. I personally had difficulty walking through the park to find it and wasn’t sure what it was even once I saw it. The monument itself is void of any writing indicating its purpose, but at the nearest entrance to the park there is a plaque explaining its meaning. There were no visitors in the few minutes that I was standing there. 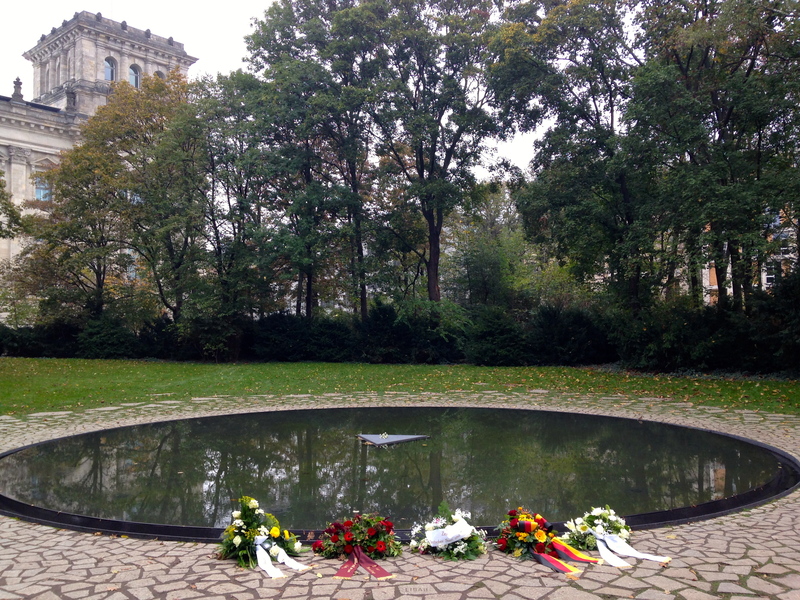 The Memorial to the Sinti and Roma Victims under National Socialism was finished in 2012. 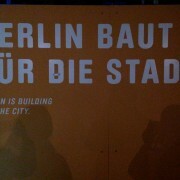 It is also in Tiergarten, but much closer to tourist sites like the Brandenburg Gate and the Bundestag. The memorial is a reflection pool surrounded by stones engraved with the names of concentration and death camps. 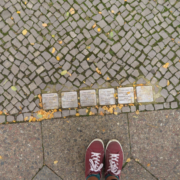 It is sectioned off from the rest of the park with a semi-transparent wall that provides a timeline of the persecution of these victims under Nazism. The few people who were here were just looking or walking around and there were some flowers placed beside the pool. 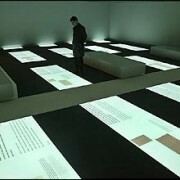 This September a Monument to the Disabled opened that I was unable to visit. If the purpose of these memorials is to commemorate the victims of the Holocaust, I do not believe they fully or accurately achieve it. The name of the Jewish memorial is ambiguous and the lack of visible information doesn’t provide an audience with limited knowledge any context. The location of this memorial is very public, but the memorials to the Roma and the Homosexuals are tucked away in Tiergarten Park. The Roma memorial feels restricted because the wall limits access to a door-sized space. The information provided for finding and explaining the Homosexual memorial in comparison to the Roma memorial is lacking. Although the behavior of the visitors cannot be regulated, I think the way that people were acting at each is very telling. 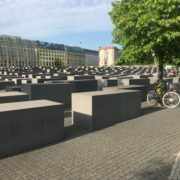 Seeing people treat the stelae like a playground suggests that there needs to be some form of above-ground information and not seeing anyone at the Homosexual memorial implies that it is invisible. But which city? It’s not longer divided between east and west, but between remembering and forgetting. There’s a past that the city is careful not to cover up, but is also assumably tired of confronting. These government sponsored memorials commemorate the victims, but also reflect a safe, constructed national memory and identity. They open up the discussion but don’t provide reconciliation. 1 Gould, M. A. and R. E. Silverman. Stumbling upon history: collective memory and the urban landscape. GeoJournal (78):791. 2 Gould, M. A. and R. E. Silverman. Stumbling upon history: collective memory and the urban landscape. GeoJournal (78): 793.